Ok you guys, it is here, finally!! 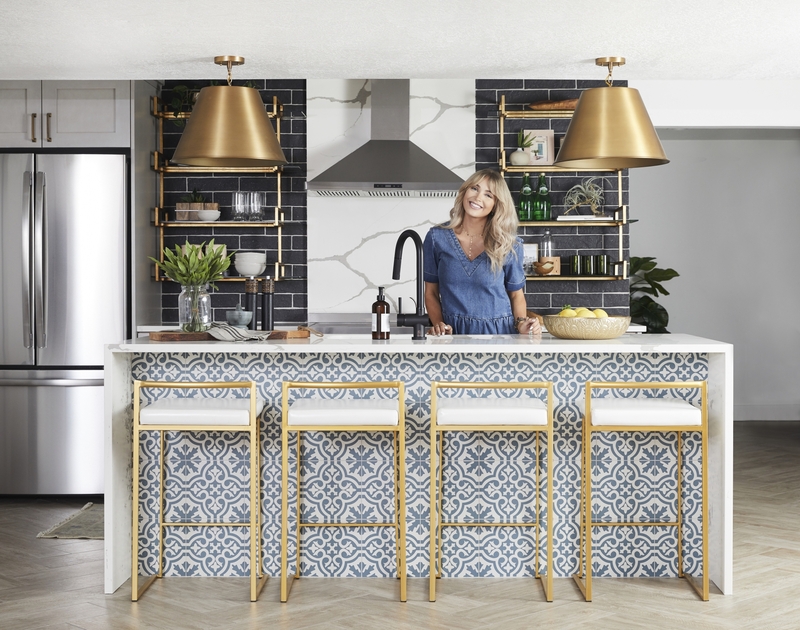 Today is the day for the basement reveal and I cannot wait to share it with you! 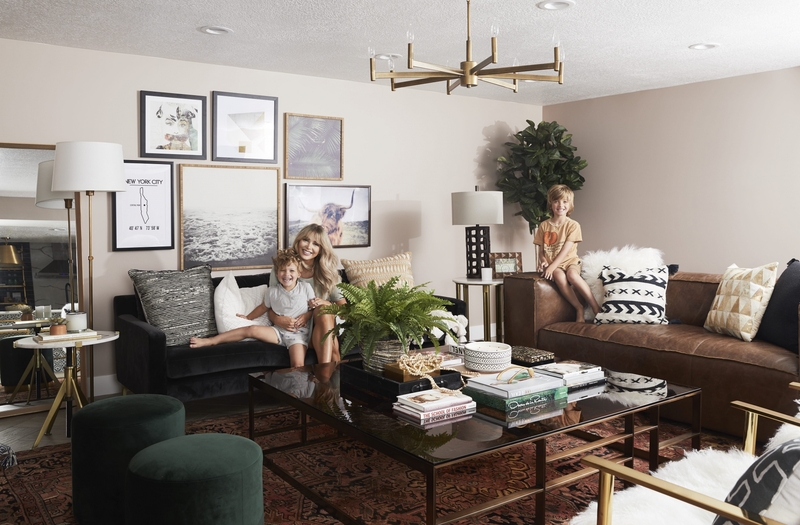 This has been a long time coming, and I am so excited to take you through the process we went through in order to bring our basement to life and turn it into a space that we love!! So, without further ado…let the basement reveal begin.  So, to start, lets talk about design. 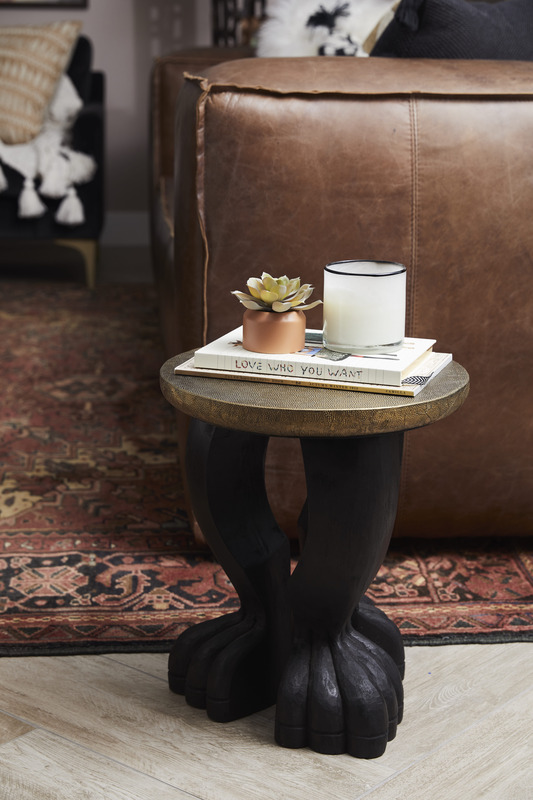 In order to turn any blank canvas and space into something that you dream of, you must first start with design. You have all heard the saying, you must learn to walk before you can run, well that is very true of the entire design process, and let’s just say I am so thankful to have partnered with Andrea West Design, so that she could be there to guide me through the design process and help make my dream basement become a reality. The design process started with Andrea and I meeting multiple times to figure out and nail down the style, look, and feel of each room. Going into this I was feeling pretty overwhelmed because of how many different ideas I had, but luckily Andrea put my nerves to ease and helped me simplify and narrow down exactly what I wanted to do for each room. 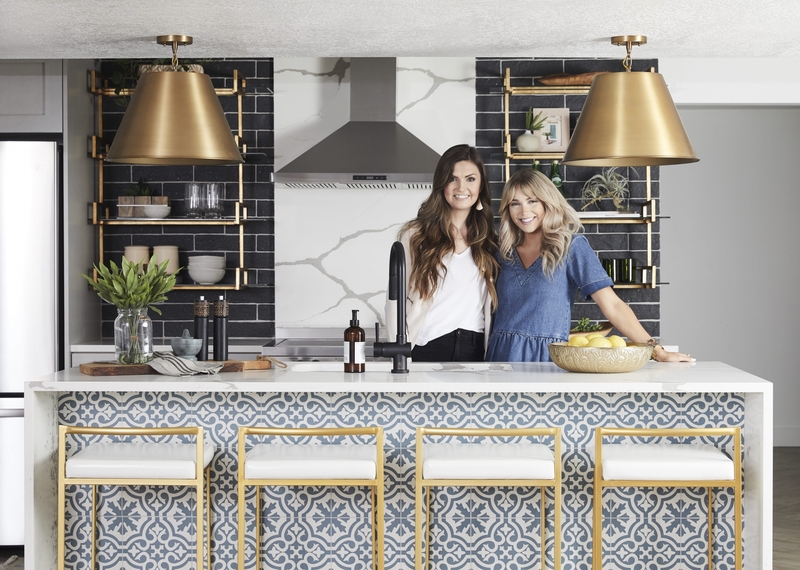 Working with Andrea West Design made my life so much easier through the process of taking concept to reality and I don’t know what I would have done without her! Having someone who knows how to take my style and taste and mix it in with the dimensions we had to work with, and make the end result something beautiful and what I had in mind in the first place is an actual form of magic. And this is exactly what Andrea did for me! I loved that she listened to my opinion and respected my design choices and style, while still infusing her expertise and guiding the entire process in a smooth way. She was so easy to work with, and as you will see below, I am beyond thrilled with how each and every detail turned out! So, I wanted to talk about each room specifically and talk about the design process with Andrea and how we selected each piece from All Modern and took our design concepts from paper to real life. 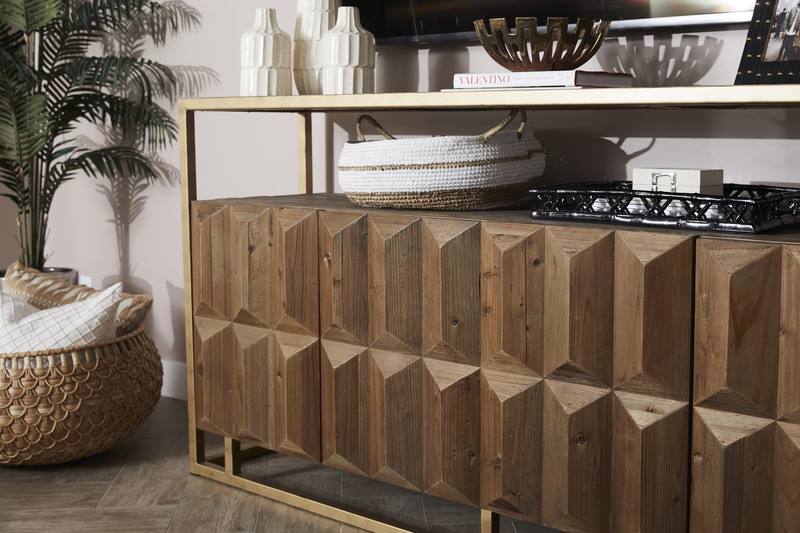 For each room, we had a specific vision that we wanted to bring to fruition, we also had a large selection of product, ranging from tiles, lighting fixtures, rugs, furniture, shelving, and everything in between that we were able to choose from on All Modern. 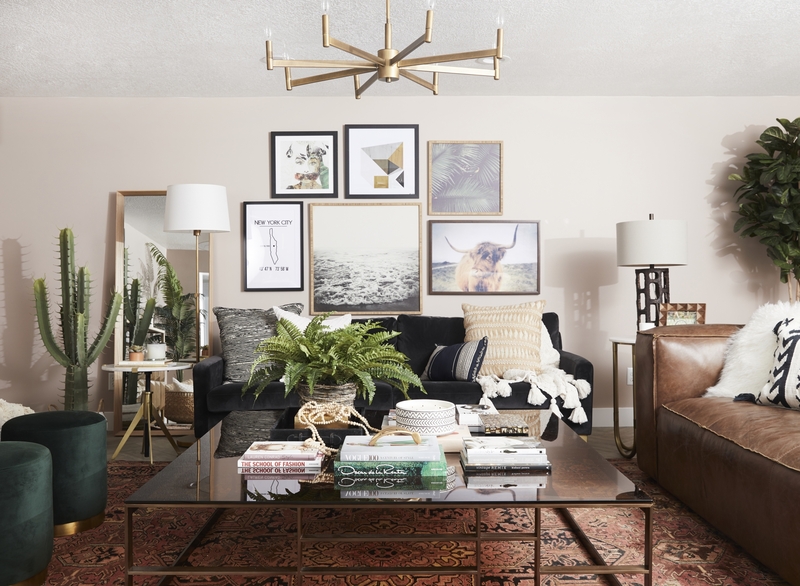 Andrea was the master at taking this wide and wonderful selection and really narrowing it down so that each piece of furniture, rug, tile type, etc., fit my style and the aesthetic I was going for. So, with our kitchen downstairs I knew one thing for sure. I wanted to take risks with this kitchen space and do somethings that was different from what you might normally see. Luckily, Andrea was onboard with this vision and was ready to go there with me. 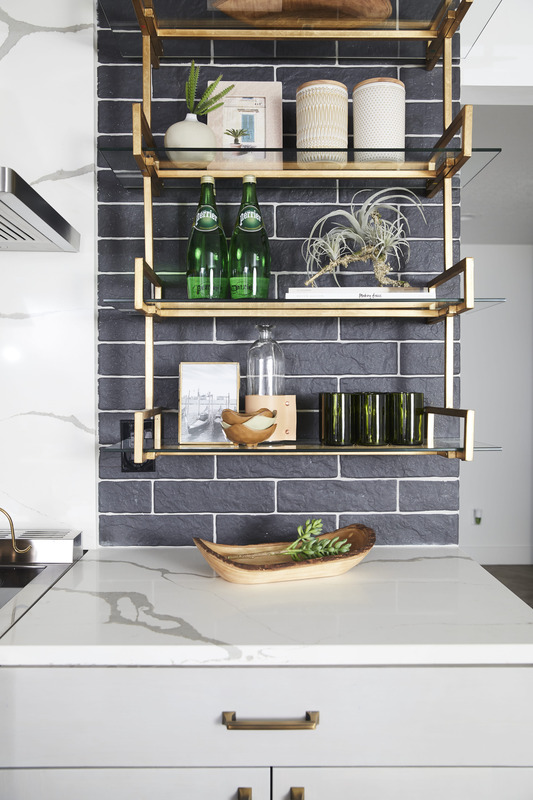 Starting with the backsplash, we both agreed that we loved the idea of keeping it dark and moody, to keep the contrast from the rest of the kitchen. 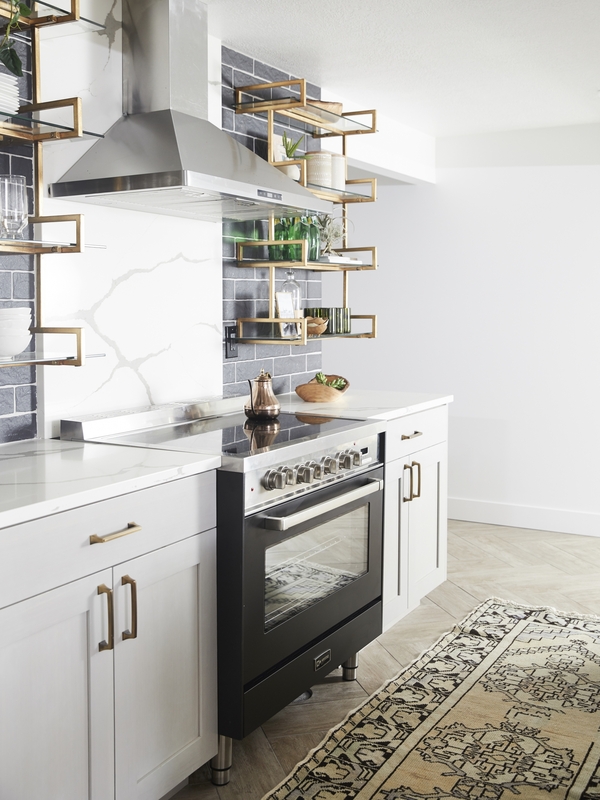 These hand-made subway tiles were the perfect choice, paired with the gold open-shelving from All Modern was the perfect choice. 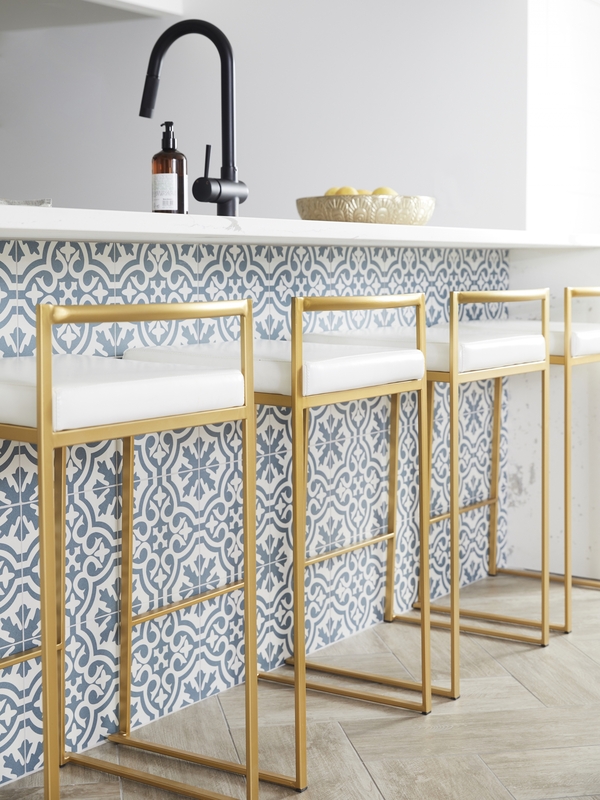 We also made a statement with the blue-patterned tile we found for the back of the bar. 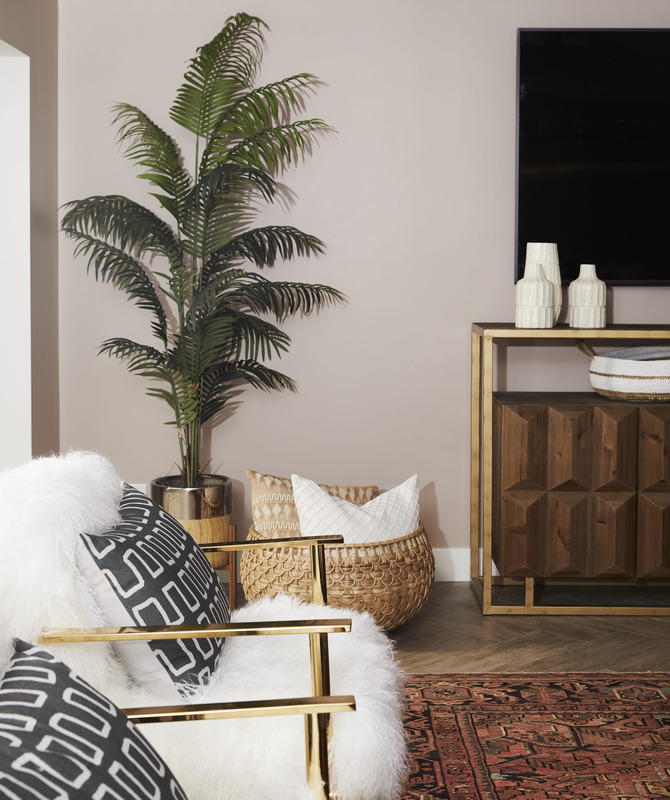 I love this look, and had seen it in our travels in various hotels, lounges, and bars and was so excited to be able to add it to my own basement. 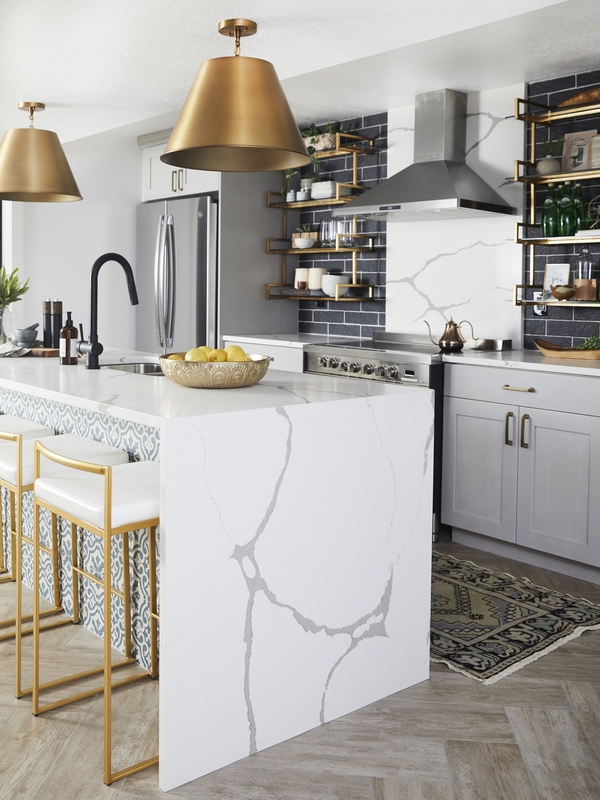 With the selection All Modern has on tile, we really couldn’t go wrong, but being able to tailor it to ideas I had in my head and find the style of tiles we were looking for was so awesome! The waterfall countertop was a key piece of the design that Andrea had focused on from the beginning with the kitchen. 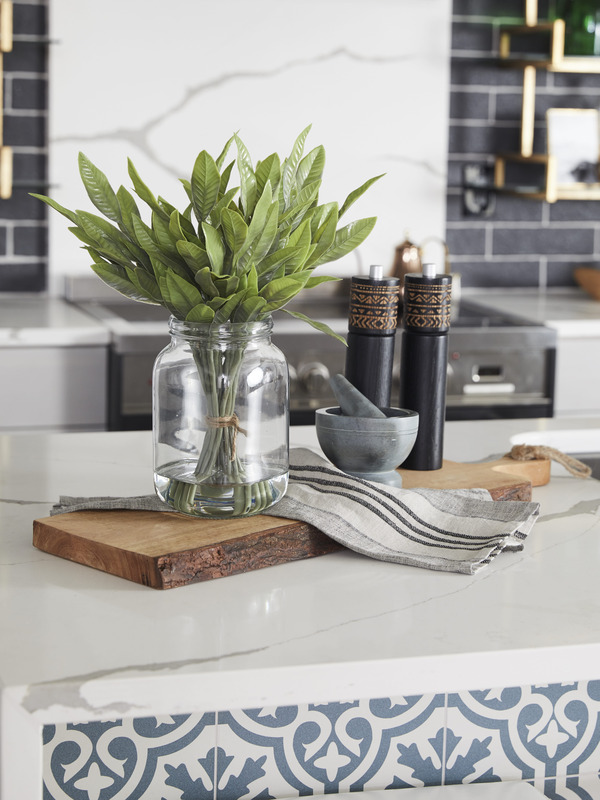 I knew I wanted to have heavy graining in the countertop and I worked with Arizona Tile (supplier) and Bedrock Quartz (fabricator) and they had exactly what I had in mind, in terms of look, feel, and quality. 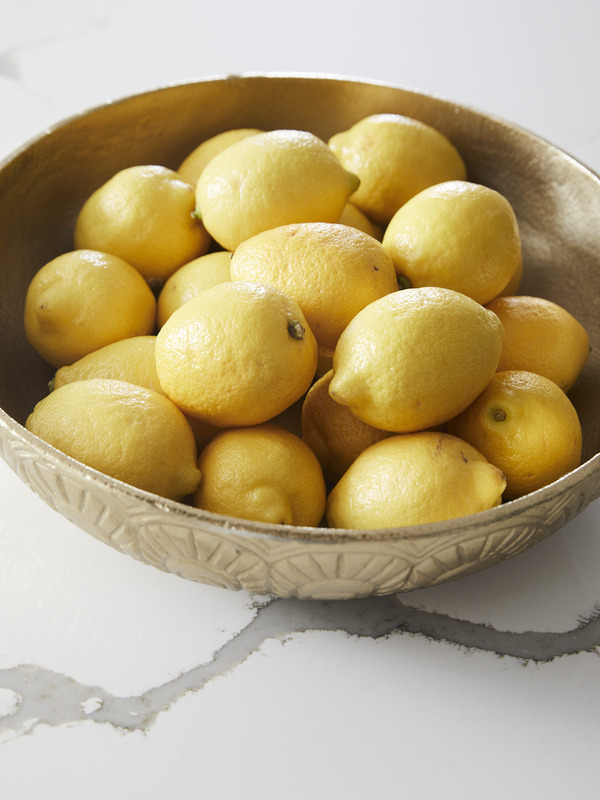 We loved the look of the countertop so much, we also ended up using it in the bathroom as well. I debated on the heavy graining countertop quite a bit, and knew it was taking a risk, but I am so thrilled with how it turned out, and I am so we glad we stuck to our guns on our original vision. 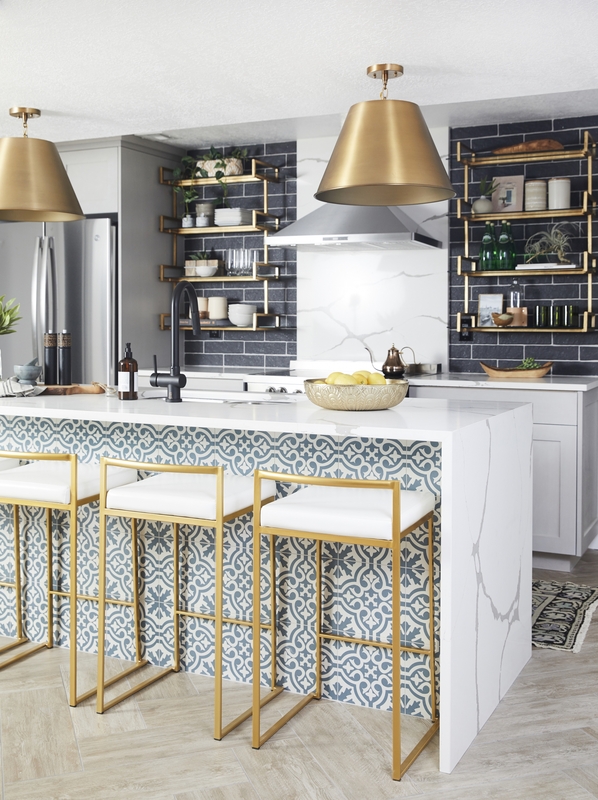 Finally, let me talk quickly about these All Modern barstools, because they bring just that perfect amount of glam (with the gold trim) to the kitchen that we knew it needed. Every time we have people over they ask about the barstools and they love hearing that they are from All Modern and at the price point they are at. I could go on and on about the kitchen, but we better move on to the next room before this post becomes a short novel! This was the room I was most excited for! 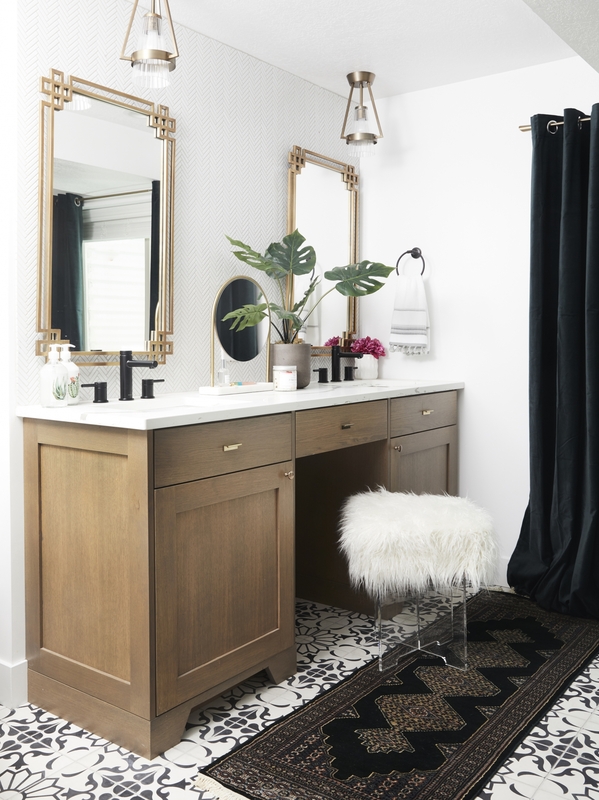 I have always envisioned this beautiful, glam, classy, yet edgy bathroom that I could spend days on end in, without boring of the way it looks and feels. 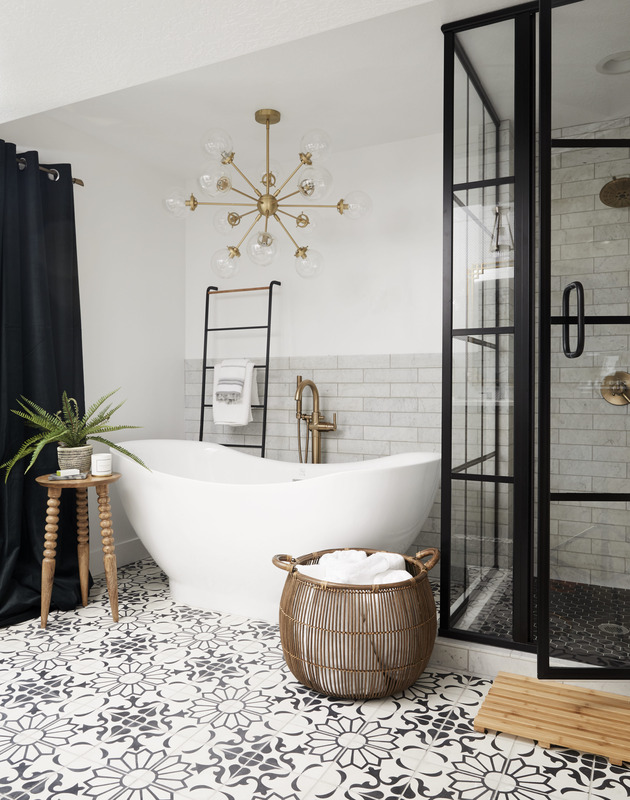 To start, Andrea (of Andrea West Design) found this tub and faucet from All Modern and we both knew right away that this was the perfect starting point to creating the bathroom of my dreams. This bathroom has a plethora of different styles, colors, and types of tiles, and is something I wanted, but this is where it was so key to have Andrea there with me to help make sense of how these tiles were all going to come together and complement each other, without competing with one another. And guess what, she worked her magic again and the tile combination was exactly on point with what I had envisioned. 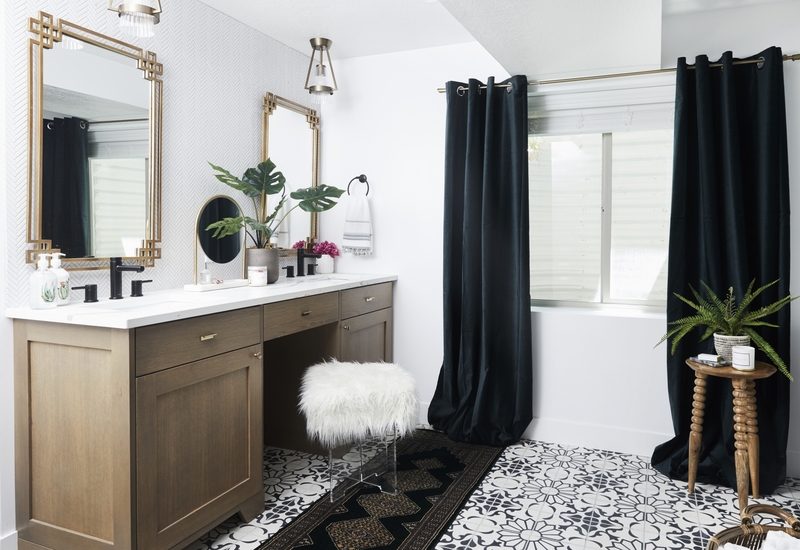 Next was selecting the right rug, a rug that would fit into the design, without taking away from the perfect storm we had created with the rest of the bathroom. 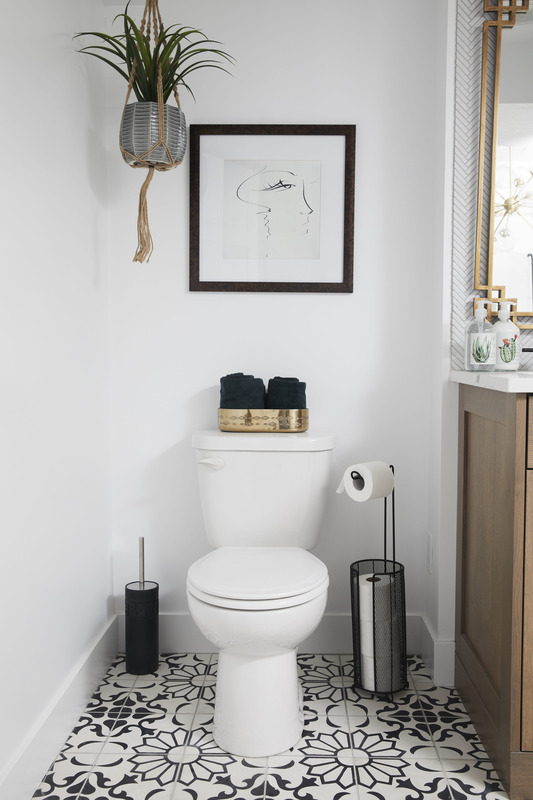 Once again, All Modern came through in the clutch, and this runner is one of my favorite pieces that we added to finish the design of the bathroom. Possibly one of our most treasured finds is the chandelier over the tub! The second Andrea found this, she text me and we both were freaking out because we knew it was that missing piece we had been searching for! Honestly, we were beyond impressed with the lighting selection on All Modern and the price point the fixtures are offered at, and finding the right light fixtures was a key detail to completing our designs with each of the rooms. I may never this bathroom…for real though. For all of you wondering, the gym reveal will be coming soon. Sorry this was such a novel, but it is hard to put into words how much I enjoyed the process of designing and finishing our basement. I could have probably gone on for days, but I hope that what I have shared gives you a glimpse into why I chose what I did, and gives insight into the design partnership and process I went through with Andrea. 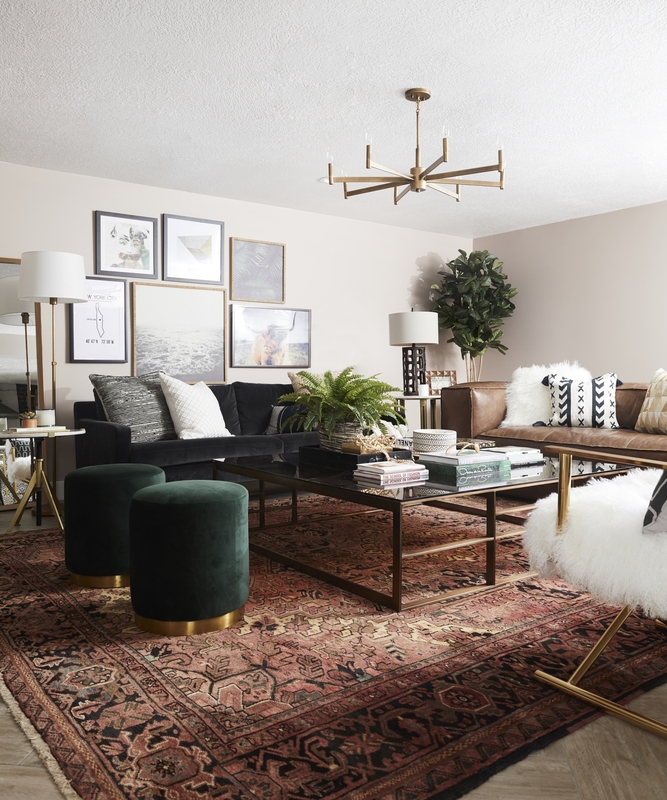 As mentioned above, I am so glad that I was able to partner with Andrea on the design element of my basement, working with her made helped make all of my basement dreams come true! I hope you enjoyed getting a peek into each of our rooms in the basement, I will be sharing the gym reveal here soon! Thank you all for following and thanks for your love and support! 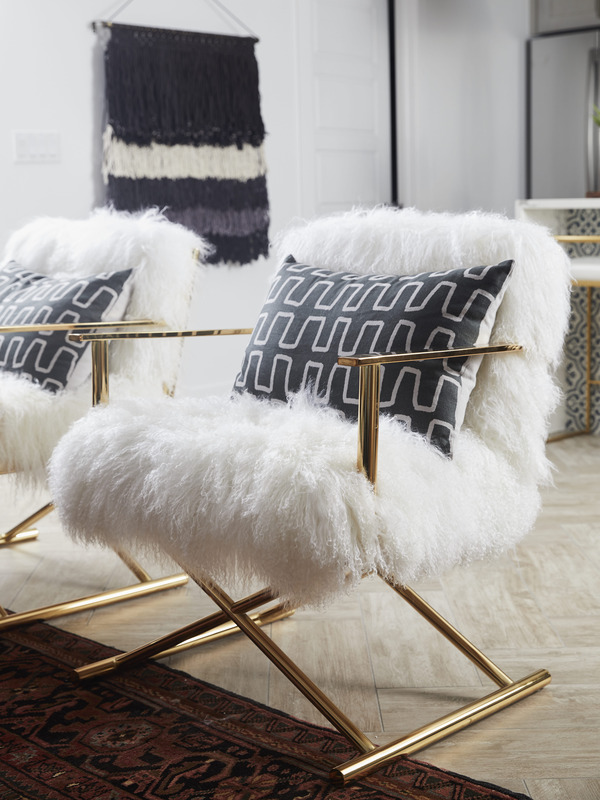 Literally your interior design style in my twin! I love the pops of emerald but not too much. I love the gold on the pieces! The bathroom and kitchen are giving me all the best vibes! You straight killed it! Love it all! Your style is seriously amazing! We are currently finishing our basement and I’m looking for the perfect shower doors. Where are yours from? Were yours a custom build? It came out beautifully. It looks unique, cozy and elegant. I especially love the tile choices. I love the bathroom floor tiles the most, so pretty! 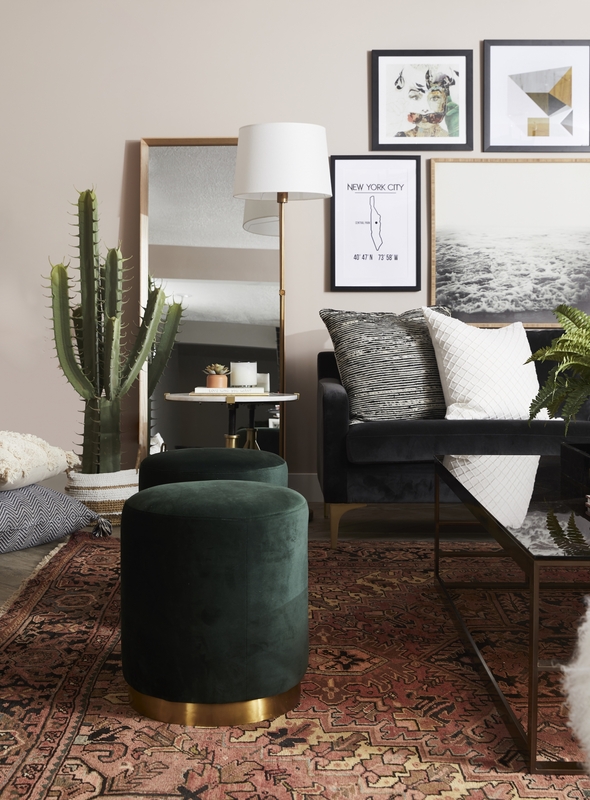 Not to mention that the emerald green velvet sofa and ottomans are just pure GOALS! This is absolutely amazing. I LOVE your style so much. 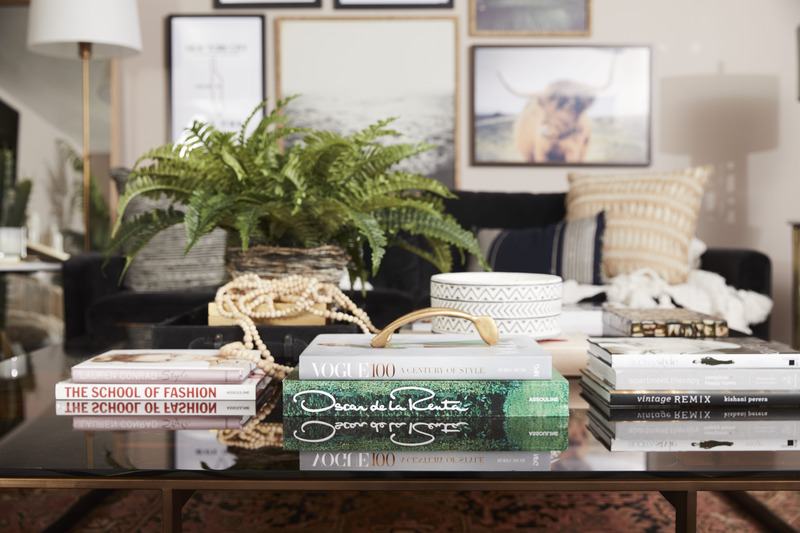 From fashion to home. I am OBSESSED with your kitchen and living room. SO MUCH GOALS. 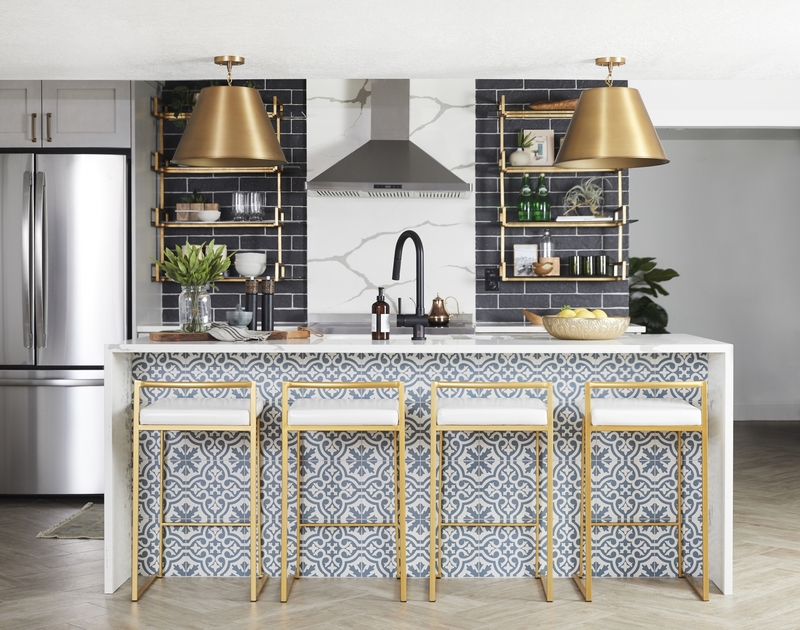 The countertop and the contrast from the backsplash to the tiles on the island are perfection. Just so curious as to why you decided to add a basement kitchen! Its amazing, no doubt, just curious! Can you please share? The color schemes and designs you went with are so awesome! I admire how well you integrate the dark with the light contrast and have the pops of marble and gold. Awesome job, this remodel is a dream!